Aqua Lake Zone is the third zone in the 8-bit version of Sonic the Hedgehog 2. The level fulfills the underwater theme for this game. 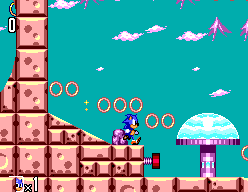 The surface areas in Acts 1 and 3 sport an abundance of operational fountains and water features, while beneath the lake's surface in Act 2, crumbling ruins provide the hedgehog with a dangerous obstacle course. The air bubbles in Aqua Lake Zone are much larger than those in the Mega Drive games. Sonic can actually jump inside some of the bubbles and ride them all the way up to the surface; a gimmick which is featured prominently in Act 2. Tidal Plant Zone in Sonic Triple Trouble and Hydrocity Zone in Sonic Mania would later revisit the concept of riding in air bubbles. In both of those games, rideable air bubbles are created by stepping on buttons. Act 2 features a Power Sneakers monitor in the Master System version, and is the only instance in the game which it appears. In the Game Gear version, it is replaced with a Super Ring monitor. The Chaos Emerald for this zone is a piece of cake. During Act 2, blue tubes transport you multiple directions. The second tube you enter, hold down left until you reach the gem. Continue holding left after collection to obtain a secret life. This is one of the more difficult levels, due mainly to the slowdown caused from being underwater, as well as the distance between air bubbles. The level is notable for featuring a gimmick that enables a spin rolling Sonic to bounce across the surface of the water like a pebble. The boss is the Mecha Sea Lion. Taraban — Crab bots that move back and forth in a small area. Every once in a while they pause to fire flashing projectiles in either direction. Zaririn — Weird crustacean bots that swim back and forth in a small area. When they spot Sonic, they pause briefly to fire off a couple of flashing projectiles, then dash off the screen. This page was last edited on 27 April 2018, at 15:29.